Home » Amazing » A Thrilling Robbery Near Kakori. By Sparky in Amazing on April 29, 2014 . It was a small rural station- Kakori! Tickets were asked for a Down train which traveled from Shahjahanpur via Lucknow. Ticket Babu was surprised. Very few people used to ask for the second class ticket from Kakori. He stared at the man who was asking for the ticket. The young man (Shachindranath Bakshi) knew it and so he moved his face away and started wiping his sweat. He took tickets and came to the platform and said to Ashfaq and Rajendra to be with him. Others were here and there as planned. Train came and they went into the empty compartment of second class. Else took the third class. Bakshi and Rajendra got up from their seat and pulled the chains. The train stopped gradually. The two came at the door. Then they came down and started walking further. “Who pulled the chain?” The guard asked them as he came. “Our box of jewels is left in Kakori, we are going to take it.” They replied. The box of jewels was in the guard’s compartment. The young men came down and started firing in the air and alerted the passengers, “Beware! Nobody moves! We are looting the government treasury.” Everyone got scared. Nobody moved from his place. The guard was standing near his van. He was showing a green flag towards the engine. Shachindra aimed the pistol at him and took away the lantern, he threw it and scolded him, “I’ll shoot you. Why were you showing the green flag?” Guard was scared. His face turned pale. Bakshi said, “Lay on the grass.” He immediately did what Bakshi had told him to do. Bakshi blowed the bulb away, which was in the guard’s van. Some revolutionaries took the box down and started their attempt to break the box with hammers, axes etc. Ashfaq was trying to break the box, others were guarding and some were helping him. There were 13 armed people and an English major in the train, but all were scared. They were all seated at their places. A man came down to look his wife who was in different coach, but got back after a single fire. Pt. Ram Prasad ‘Bismil’ was leading them. Finally the box broke after several attempts of Ashfaq and the bags filled with money were taken out. Then a voice came, it was a train coming from Lucknow. But the train came and went. The revolutionaries then took a breath of relaxation. Bismil then said to move. They moved to their respective ways. The train was still standing. It was an interesting and quiet atmosphere. Bakshi took pity on the Indian guard. Other members of the party vanished in the thick forests of Kakori. In the way, they recollected all the money in a big bag and threw away the other bags. Then they reached Lucknow by different ways. Azad spent that night sitting in a park. 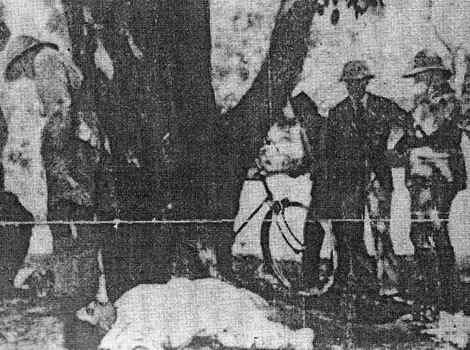 The robbery was conceived by Ram Prasad Bismil and Ashfaqullah Khan who belonged to the Hindustan Republican Association (HRA), which became later the Hindustan Socialist Republican Association.